These heaters are manufactured with a hydraulic press that inserts a high temperature heating element into a grooved aluminum channel. The heaters are clamped into place with stainless steel straps to maintain intimate contact with the item to be heated. The aluminum channels are lightweight with high thermal conductivity for rapid heating. These same characteristics provide excellent cool down properties as well. Starflex bands are also available with water cooling, both as a cool only band and a heat/cool band. 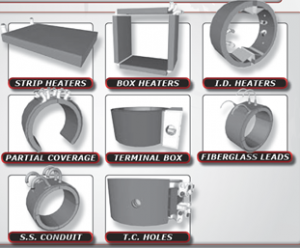 These band heaters can be used on extruders, injection molding machines, blown film dies, and any other applications that require rugged, long lasting heaters. The heater bands can be opened completely, allowing easy installation and eliminating the need to remove other items from the barrel. Starflex band heaters have the durability of a cast-in heater at a fraction of the cost. This heater style can be made into strip heaters, box heaters, inside diameter heaters with reverse construction and partial coverage heaters. Heaters can be made with terminal boxes, fiberglass leads, flexible stainless steel conduit and thermocouple holes. Custom diameters and wattages are available with a 10 week standard lead time. 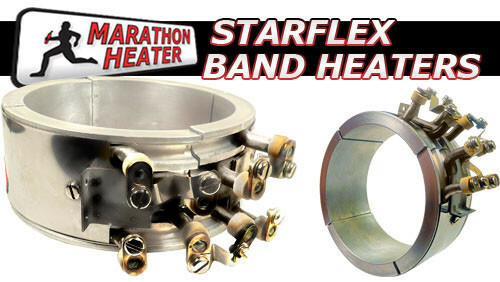 Call Jobco at 479-424-1300 to order your Starflex heater bands.